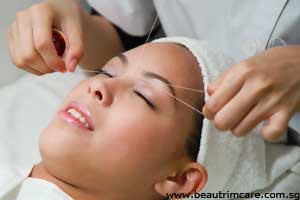 In Eyebrow threading, a thin cotton thread is used, then twisted. It is then glide over areas of unwanted hair, removing the hair from the roots. Unlike another method like waxing, threading can remove short lines of hair leaving the area cleaned and perfectly defined. The advantages of eyebrow threading, as opposed of eyebrow waxing, is that it helps to precisely control in shaping eyebrows and it is more gentler on the skin. Eyebrow Threading can sometimes be painful as line of hairs are removed at the same time: however this can be minimised when threading is done properly. Eyebrow threading gives more defined and precise shape and the method can create better definition for eyebrows. This is also used as a method of removing facial hairs upper lip and chin area. It is also often used for removing hair on arms and legs, although the hairs in those areas of the body is usually more coarse and there is often toomuch to remove.